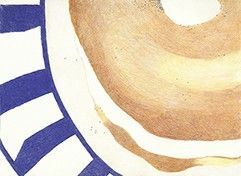 Colored pencil drawing based on detail from smaller drawing in series. This series features desserts and other treats provided by local bakeries, candy stores, and street vendors encountered during a 9-month family trip around the world. The family covered 16 countries and 51 cities — I covered 125 desserts.